← A Walk In The Woods…Available To Pre-order Now! 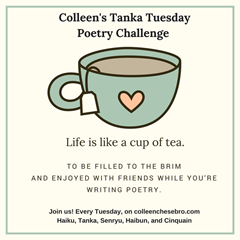 This entry was posted in Challenges and tagged #1 Best Selling Author Annette Rochelle Aben, amusement, Annette Rochelle Aben Communicates, Challenges, Colleen Chesebro, Colleen's Weekly Tanka Tuesday Poetry Challenge, dress up, pretend, shadorma. Bookmark the permalink. Oh, I’ll just bet that was fun! Oh, I bet it was! Cute! This reminded me of my sparkly dress up days! Thank you! Here’s to our memories and how they sparkle! Thank you, Vashti! I am certain you will nail it! I do like the flexibility of syllables. We are always children don’t you think?